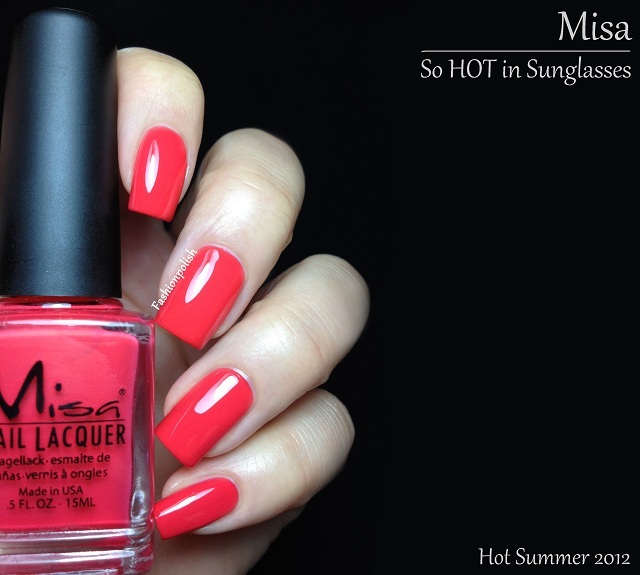 Fashion Polish: Misa Hot Summer 2012 Review and...Giveaway! 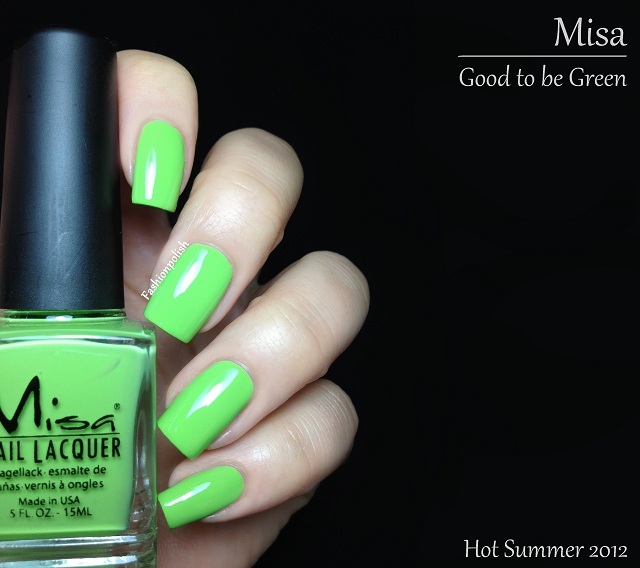 Misa Hot Summer 2012 Review and...Giveaway! It's the weekend! I hope you've all had a great week but most of all, I hope you'll have an amazing weekend! And what could be better than fun and cheerful colors to put us all in the mood? BubblePop, Double Dutch, Good To Be Green, Pink Cadillac, Skinny Dipping and So HOT In Sunglasses. 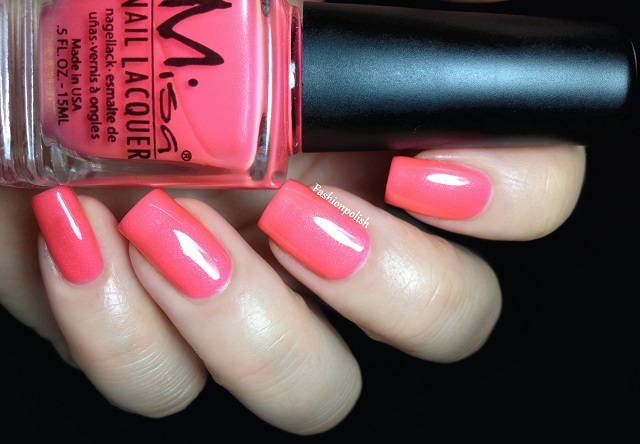 bright neon pink shimmer with coral undertones. 2 coats. soft lavender pink creme. 2 coats. 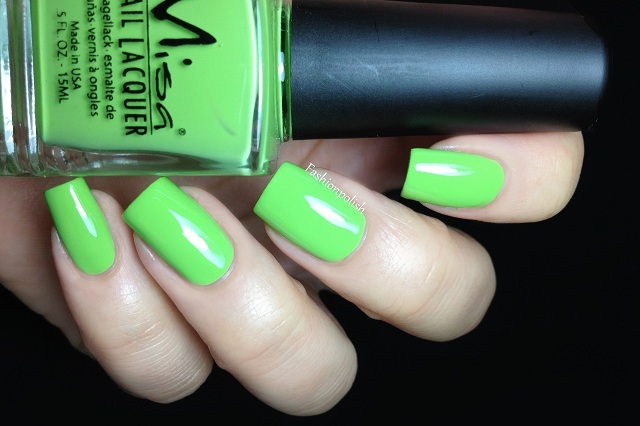 bright yellow based green creme. 2 coats. soft-neon yellow based pink shimmer. 3 coats. turquoise leaning teal base with a bright blue shimmer. 2 coats. 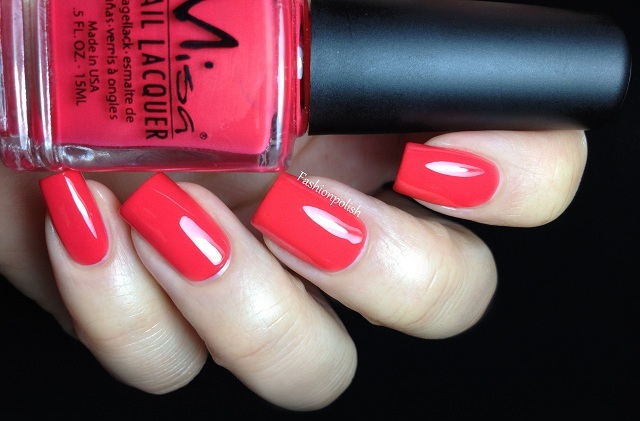 vivid coral red creme. 2 coats. Formula was really good on all of these polishes. 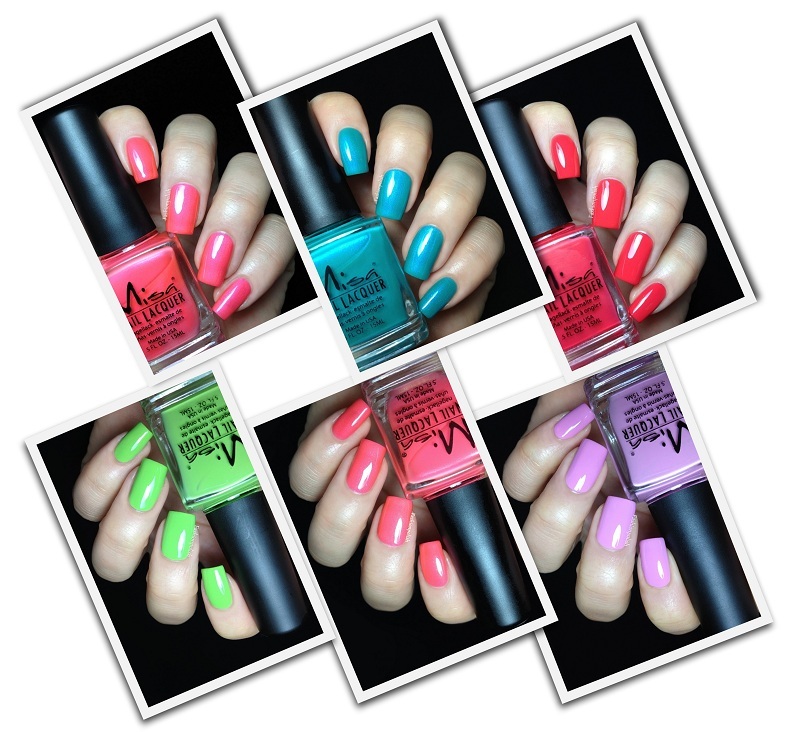 Pink Cadillac was the less opaque and required 3 coats while Good to be Green and So HOT in Sunglasses the most pigmented and almost one coaters. As for the other three, I needed 2 coats of each. I absolutely love the shimmers! 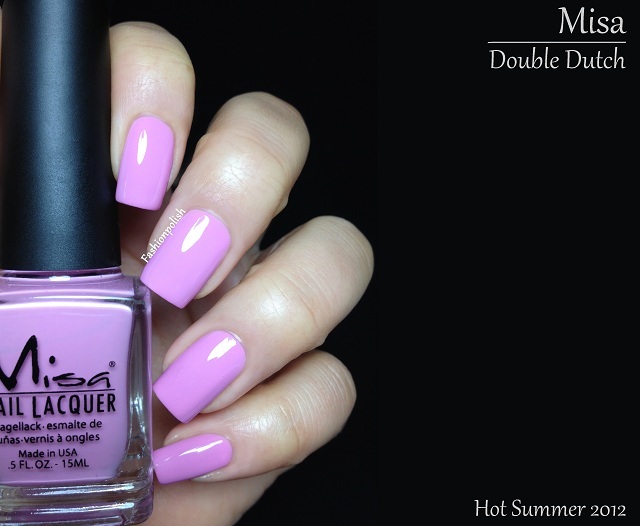 The Hot Summer 2012 polishes are already available on misacosmetics.com and retail for $7.50 each. And now, your chance to win the complete HOT Summer 2012!!! The giveaway is open internationally to all those who are legal of age in their country until October 14th. I will randomly pick the winner on October 15th and she (or he) will have 48 hours to reply. Is Misa available in any brick and mortar stores? Double Dutch and Skinny Dipping are my favourites. What a great way to start autumn! These are hot for sure. I really like the blue polish. I've never tried their polishes before, but they look promising. I really like So HOT in Sunglasses and Bubblepop. It's good to see Misa releasing a strong collection. I think the last few collections have had some issues and reviews from most bloggers weren't positive. I have almost every polish from the What I Like About You collection, a few from Spark My Interest and the polish Blame it on Fat Tuesday. 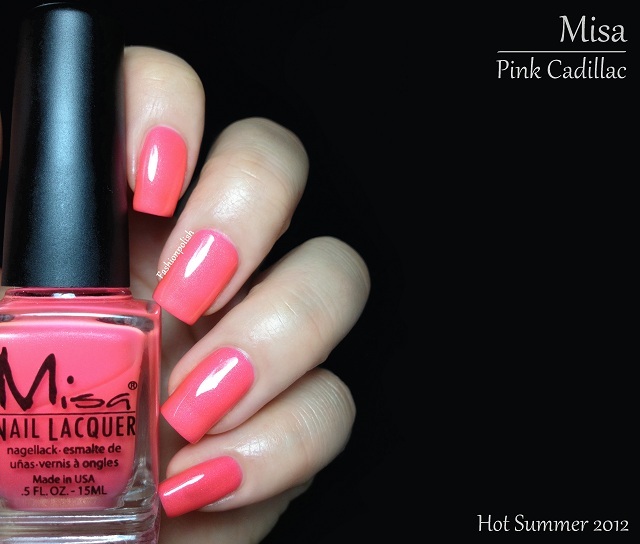 From the pics and your reviews, it seems as though Misa has returned to it's previous form and I'm looking forward to trying Misa Summer 2012. Wow what gorgeous colors! Thanks for the giveaway!! these are gorgeous! i have never commented before but i have been following you for a long time. I love the Double Dutch Polish, such a pretty shade of purple. Bubble Pop and Skinny DipPing are my favorites. Oh I just fall for the double dutch I love lavander colors. I'm not sure which is prettier Double Dutch or Bubble Pop. I love the dual color of Bubble Pop, but that purple is simply stunning! It would be awesome to win, I don't have any Misa polishes in my stash. I think this is a really good collection. My favorite is Good to be green. This collection is so awesome !! double dutch looks so amazing! What a great collection! Some of the colors are really nice to wear all year, not just summer! and Skinny Dipping is to die for! I love that the shimmer translates into the nails! I think your swatches make any polish look amazing! lol But I'm totally in love with skinny dipping and so HOT in sunglasses!! These colors are AMAZING!!! I would wear them all year round for a great pop of color anytime, anywhere! These colors are AMAZING!!! I would wear them year round for that extra little pop of color. The shimmer is really nice in all of these but I looooove Skinny Dipping! amazing colors :D, I want them! Your swatches are always amazing. Thanks for the giveaway. i love your swatches - you make them so perfect! OMG these swatches made me even more sad about the end of the season I love the most, they really scream Summer! Thank You for great prizes! Thanks so much for doing this. I love your swatches, really loving the new style in the photos too. It was nice to see these. Great Giveway! I LOVE Double Dutch! I've been following your blog for awhile now and am always impressed with your unusual finds and collection swatches. I have to admit, probably half of my stash (300+) were seen here first. Thank you for taking the time to share with us! Awesome giveaway. 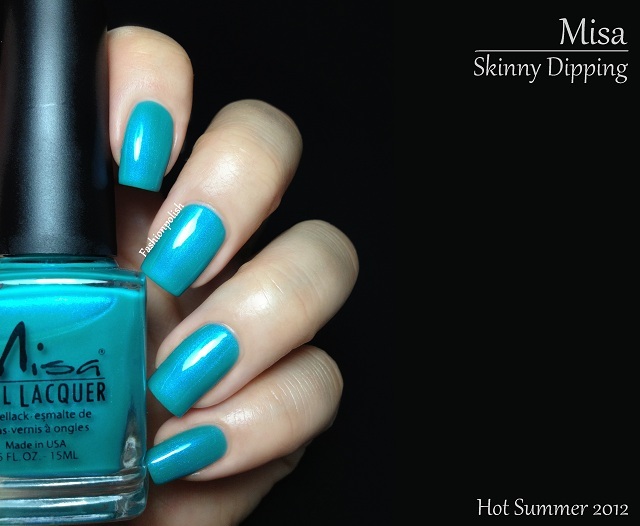 I love blue polish so Skinny Dipping is my fave. I follow your blog faithfully but I have never left a comment before (so I did not answer yes to your question about leaving a comment in the past 30 days). I just wanted to tell you how much I enjoy reading your blog and viewing your swatches. .... you have the loveliest nails and make me want polishes I know I'll never wear :-) My favorites are Bubblepop, Pink Cadillac and So Hot in Sunglasses. ... they are so beautiful. Love your nails and swatches! This collection is perfect for summer! Awesome giveaway! So want to try those polishes! I absolutely adore your swatches, they're beautiful! Very pretty. Looking forward to trying Misas one day! This is a great giveaway! I get so much inspiration from your blog! Love, love, love these colors. A final hurray to summer and I need that! i want them all! i love neons with shimmer and these cremes are so unique! Skinny Dipping is so pretty! Love your nails and cuticles. I can never get mine to look anything close to yours. Fingers crossed that I can get my nails on these gorgeous colors. I loooooove the lavender color!